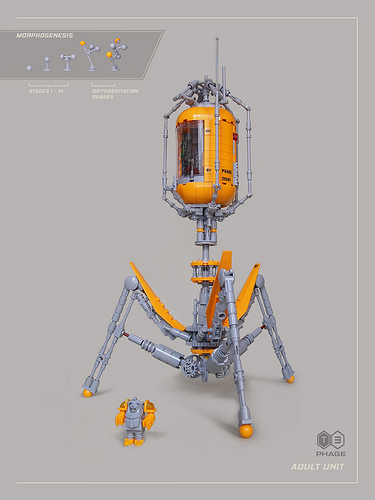 It does not take an exceptional amount of imagination to see a landing module in a stereotypical bacteriophage, the type of virus that infects bacteria. So I am surprised that the latest creation from Dwalin Forkbeard is the first time I have seen the aforementioned virus used as inspiration for a LEGO spaceship, especially given how crazy some builders can get with their spaceship designs. Sometimes it takes someone with an outside perspective on the theme to come up with the most out-of-the-box idea. And, as might be expected from a builder with a name taken from The Hobbit, they have so far mostly focused on medieval and fantasy creations, quite often centered about dwarves, as, again, you might imagine. The spacecraft features the main parts of a bacteriophage, but giving a mechanical twist to them: the head, which has the angular appearance we are used to from phage models; the tail that actually features some finer details; and the leg-like fibers that the real-life virus uses to attach to a bacterial cell, while the Invader T3 Phage uses them to land on planets or perhaps huge space-bacteria. The builder says that the pilot, the strange little character standing beside the spacecraft, is a highly complicated sentient DNA-form, a backstory which just adds to the charm of this unique creation. Even putting the originality aside, this is still a very good build. The colour blocking is done well, and the spherical ends of the legs just pop in the bright light orange colour. A few custom stickers saying “PHAGE” and “EMERGENCY DNA TANK” round it off perfectly as a very memorable spaceship.